'Krishna and Kans', an animated 3D feature film produced by Reliance Animation, is hoping to bust the existing sentiment that such films are only for kids. The two-hour flick, which will release on August 3, is packed with all the ingredients required for a masala blockbuster. And, with Krishna as its hero and this season being a built-up to Janamashtmi, it hopes to get the required eyeballs. In the city to attend the pre release event of the film, Ashish SK, the CEO of Reliance Animation, said that the production was a result of more than seven years of painstaking research. "The acharyas of ISKCON Bangalore have been part of our research team. The scholars at the Tirupati Devsthanam have penned the shlokas which we have used in our narrative," he said. Nagpur is the springboard for the pre release events to be unleashed in other cities. "That's because among the 1200 people who are associated with the film, a bulk are from this region," said Ashish who too hails from the city. Elaborating on the USP of the film, he said that the music and voices used for different characters are the strength of the film. "We have used the best in the business. Om Puri, Manoj Bajpai, Juhi Chawla, AK Hangal and Mukesh Khanna have lent their voices," he said. Describing Krishna as an international brand, Ashish said that the world is familiar to this Indian Epic hero due to the Hare Krishna cult spread by ISKCON Bangalore. "From grandparents to parents and children, entire families are Krishna lovers as he is a warrior, a destroyer of evil, a friend and a cute prankster. This film thus will appeal to the entire family," he said, adding that it would have a simultaneous worldwide release. Replete with songs sung by Sonu Nigam, Shreya Ghoshal and Sunidhi Chauhan there is an item number too filmed on 'Putna', the evil child killer. "The chants, shlokas and the flute played by Rakesh Chaurasia will delight the elders," said Ashish.
" 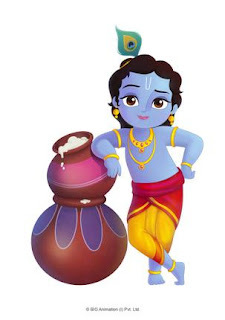 Krishna Aur Kans", the 3D animated film, is all set to release in four different languages on August 3. The Hindi language movie will release in all major Hindi speaking territories, the Tamil movie titled " Gokulathil Kannan" will release in Tamil Nadu, the Telugu movie will be called as "Chinni Krishna" and the English version will be released in Kerela as "Krishna Aur Kans". Made under the banner of Reliance Animation, a subsidy of Reliance Entertainment, the film will release in over 350 screens across the country just one week ahead of Janmashtami.